To understand Atomic Particle Colloidal Silver, the reader will need to set aside any preconceived notions regarding Nanoparticle and Ionic Colloids. The standards of production that are set for those types of colloids do not apply to Atomic Particle colloidal products which will not conform to the same tests and procedures. Atomic Particle Colloidal Silver: Meets, and exceeds all known standards that apply to nanoparticle products, due to the particle size of .1 nm, high PPM concentrations of Silver Atomic Particles that are attached to water molecule "clusters" that are made with a 100% chemical (catalyst) free process. 1. Colloidal Silver has been reported to kill over 650 different Viruses, Bacteria, Parasites, and Fungus. 2. Before the arrival of antibiotics as early as the 1800's, silver was the physician's first choice for an agent with antibiotic properties, in fact, Doctors Prescribed it, and even applied it intravenously since the 1850's. 3. Colloidal Silver was known as Collargolum back in the 1800's, and Silver Salts made by the Alchemists were one of the reasons why the Bubonic Plague was exterminated. 4. Super-bugs have developed a resistance to antibiotics, and have even developed resistance to most Silver NANOPARTICLE products. However, there are no reports that they have developed immunity against Atomic Particle Colloidal Silver. 5. Doctors are hesitant to prescribe antibiotics because viruses and bacteria have developed resistance to antibiotics due to the overuse and abuse of antibiotics. 6. 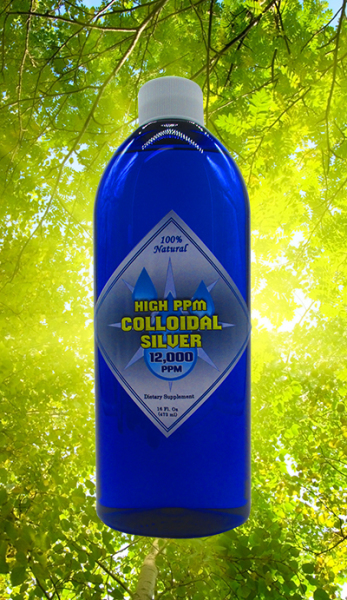 Colloidal Silver is utilized in many other countries as an antimicrobial agent and used for health, animal wellness, agriculture and water sanitation. 7. Silver has been reported to have anti-cancerous properties that may fight cancer-causing viruses, bacteria, and fungus, you just need the right silver Particle Size and Silver Atomic Particles are perfect for penetrating into those life taking Pathogens. Professionals agree that the smaller the silver particle, the better it can penetrate into a virus, bacteria, parasite or free radical. The primary difference between Atomic Particle Colloidal Silver in comparison to nanoparticle low PPM Silver is the "Particles (or Parts) Per Million" availability to deal with multi-millions of viruses that may have taken occupation of its host. Low PPM is not going to make a huge difference in how you feel when you have Millions of PPM of viruses or bacteria in your body. The Particle size is EVERYTHING when it comes down to stopping pathogens! High PPM of 100% Natural Atomic Particle Antiviral Elements. Available Concentrations: 200, 600, 2000 , 3000, 4000, 6000, 8000, 10,000 and even up to 12,000 Parts Per Million! Our PPM is verifiable with readily available TDS Meters that can measure up 19,999 PPM. The fact is that our Atomic Particle Generators can exceed 30,000 PPM. However, there are no TDS meters that can measure those high PPM values. Our Colloidal Silver and antioxidant solutions are non-prescription dietary supplements in the purest, natural and chemical-free form with 100% bio-availability! Just the identified elements and distilled water are used, nothing else! Easy on the stomach and easy on your mind. Colloidal Silver atomic particles are much more easy to assimilate into the body. Due to the atomic silver super tiny size, they are very easy for the body to expel along with 30 billion other cells that have lost their life expectancy and are expelled when nature calls you to use your restroom. Plus, they are least likely to get trapped in the kidneys or liver as does nanoparticle colloidal silver and ionic silver (As per the Mayo Clinic Report). With Our High PPM Atomic Particle Colloidal Silver products, there are more Micro Bullets (PPM) to deal with those life taking free radicals and abnormal tumor causing anomalies. Does the Colloidal Silver Product work? This wonderful lady had been fighting Head and Neck Cancer along with a huge cancer growth on her face for 20 years. In 2015 through 2016 that growth on her face morphed into flesh-eating cancer, that took half her face off along with one eye. This lady had a huge hole on her face, and you could see her tongue as she spoke where her right cheek used to be. The Bacteria almost made it to her brain. Sure, it's not a pretty sight to look at, but it's a real person, not a model, not an actor, these life-disrupting situations can happen to anyone and at any time, which is why you should stock your medicine cabinet with our High PPM Colloidal Silver. Throughout the 20 years of her infirmity, she spent a fortune seeking help from Doctors and Naturopathic Practitioners, she tried many different types of nanoparticle silver products, then she tried different brands of ionic silver, and found no answer to this relentless life taking disease and flesh-eating cancer which grew more and faster as she used inferior low ppm silver products. Fortunately, she did not give up and kept looking for answers and found our website, she took a chance on our Pure and Perfect High PPM Colloidal Silver and CanCleanse products and found the amazing answers she was looking for. As of July 2017, she has sent us many videos of her progress. Results speak louder than well-structured Sales presentions! Without a doubt, we have the world's most perfect Colloidal Silver dietary supplements and immune boosters that contain "Silver Minerals" and other elements. Why Minerals? Silver, Gold or other elements that are in mineral form, are no longer metallic. Because they are no longer metals, they cannot combine with the stomach acid to create chemical reactions of other toxic chemical compounds your body. Colloidal Silver Atoms will bypass the horrific side effects that have been associated with nanoparticle and ionic colloidal silver. Acid does not affect Minerals only metals, and silver nanoparticles (which are still metallic) WILL react with acids. No chemicals are ever used in our production process, which means that there are no toxic residues present that are usually caused by chemicals. NO Chemicals Used or Added! Not made with Chloroform (Embalming Fluid ) some companies with patents use this chemical. Only Pure Silver Minerals and Distilled Water. Our high PPM concentrations have a faster and successful kill rate of free radicals that are known destroy health and bring on premature aging. High PPM colloidal silver concentrations have a machine gun like effect, which seemingly fires atomic particles at pathogens and free radicals. Atomic Sized particles are without a doubt the best size for penetrating into viruses and other pathogens at a Cellular and Sub-Cellular level since they are much smaller than any cell in your body. With our High PPM Colloidal Silver products, not only do you get the world's most chemical free, nontoxic colloids, you can also dilute them to make your own custom PPM solution that you feel is most appropriate for your needs. Short List of Diseases that Colloidal Silver may fight.